To the unaided eye, the Triangulum Galaxy is just a smudge in the night sky. But it’s a smudge that contains about 40 billion stars. It also contains some very active star-forming regions, which have attracted the eyes of astronomers. The Triangulum has a couple other names: Messier 33 and NGC 598. But Triangulum is the easier name to remember. (It’s also sometimes called the “Pinwheel Galaxy.”) But whatever name you choose to call it, this Hubble image brings it to life. Since the birth of modern astronomy, scientists have sought to determine the full extent of the Milky Way galaxy and learn more about its structure, formation and evolution. According to current theories, it is widely believed that the Milky Way formed shortly after the Big Bang (roughly 13.51 billion years ago). This was the result of the first stars and star clusters coming together, as well as the accretion of gas directly from the Galactic halo. During the 1960s, scientists discovered a massive radio source (known as Sagittarius A*) at the center of the Milky Way, which was later revealed to be a Supermassive Black Holes (SMBH). Since then, they have learned that these SMBHs reside at the center of most massive galaxies. The presence of these black holes is also what allows the centers of these galaxies to have a higher than normal luminosity – aka. Active Galactic Nuclei (AGNs). In the past few years, astronomers have also observed fast molecular outflows emanating from AGNs which left them puzzled. 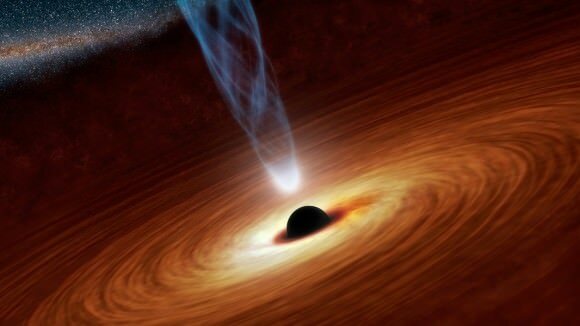 For one, it was a mystery how any particles could survive the heat and energy of a black hole’s outflow. But according to a new study produced by researchers from Northwestern University, these molecules were actually born within the winds themselves. This theory may help explain how stars form in extreme environments. The study recently appeared in The Monthly Notices of the Royal Astronomical Society under the title “The origin of fast molecular outflows in quasars: molecule formation in AGN-driven galactic winds.” The study was conducted by Lindheimer post-doctoral fellow Alexander J Richings and assistant professor Claude-André Faucher-Giguère from Northwestern University’s Center for Interdisciplinary Research and Exploration in Astrophysics (CIERA). The existence of energetic outflows form SMBHs was first confirmed in 2015, when researchers used the ESA’s Herschel Space Observatory and data from the Japanese/US Suzaku satellite to observe the AGN of a galaxy known as IRAS F11119+3257. Such outflows, they determined, are responsible for draining galaxies of their interstellar gas, which has an arresting effect on the formation of new stars and can lead to “red and dead” elliptical galaxies. This was followed-up in 2017 with observations that indicated that rapidly moving new stars formed in these outflows, something that astronomers previously thought to be impossible because of the extreme conditions present within them. By theorizing that these particles are actually the product of black hole winds, Richings and Faucher-Giguère have managed to address questions raised by these previous observations. Richings and Faucher-Giguère look forward to the day when their theory can be confirmed by next-generation missions. They predict that new molecules formed by black hole outflows would be brighter in the infrared wavelength than pre-existing molecules. So when the James Webb Space Telescope takes to space in the Spring of 2019, it will be able to map these outflows in detail using its advance IR instruments. One of the most exciting things about the current era of astronomy is the way new discoveries are shedding light on decades-old mysteries. But when these discoveries lead to theories that offer symmetry to what were once thought to be incongruous pieces of evidence, that’s when things get especially exciting. Basically, it lets us know that we are moving closer to a greater understanding of our Universe! But by combining the power of the Hubble Space Telescope with a technique known as gravitational lensing, a team of astronomers made the first discovery of a compact galaxy that stopped making stars just a few billion years after the Big Bang. The discovery of such a galaxy existing so early in the Universe is unprecedented and represents a major challenge to \theories of how massive galaxies form and evolve. Their findings were reported in a study titled “A Massive, Dead Disk Galaxy in the Early Universe“, which appeared in the June 22 issue of the journal Nature. As is indicated in the study, the team relied on data from Hubble which they combined with gravitational lensing – where a massive cluster of galaxies magnifies and stretches images of more distant galaxies beyond them – to study the distant galaxy known as MACS 2129-1. What they found was completely unexpected. Given the age of the galaxy – dated to just three billion years after the Big Bang – they expected to see a chaotic ball of stars that were forming due to early galaxies merging. Instead, they noticed that the galaxy, which was disk-shaped (like the Milky Way), was effectively dead – meaning that star formation had already ceased within it. This was a surprise, seeing as how astronomers did not expect to see this so early in the Universe. What’s more, it was the first time that direct evidence has been obtained that shows how at least some of the earliest “dead” galaxies in the Universe evolved from disk-shaped objects to become the giant elliptical galaxies that we regularly see in the Universe today. In previous studies, it was assumed that distant dead galaxies were similar in structure to the local elliptical galaxies they eventually evolved into. Prior to this study, confirmation of this hypothesis was not possible since current instruments are not powerful enough to see that far into space. But by combining the power of gravitational lensing with Hubble’s high resolution, Toft and his team were able to see this dead galaxy clearly. Combining rotational velocity measurements from the ESO’s Very Large Telescope (VLT) with archival data from the Cluster Lensing And Supernova survey with Hubble (CLASH), they were able to determine the size of the galaxy, mass, and age as well as its (defunct) rate of star formation. Ultimately, they found that the remote galaxy is three times as massive as the Milky Way, though only half its size, and is spinning more than twice as fast. Why this galaxy stopped forming stars is still unknown, and will require follow-up surveys using more sophisticated instruments. But in the meantime, there are some possible theories. For instance, it could be the result of an active galactic nucleus, where a supermassive black hole at the center of MACS 2129-1 inhibited star formation by heating the galaxy’s gas and expelling it from the galaxy. In the coming years, Toft and his team hope to take advantage of the James Webb Telescope (which will be launching in 2018) to search for more early dead galaxies, in the hopes that it can shed light on the unresolved questions this discover raises. And with the ability to probe deeper into space, astronomers anticipate that a great deal more will be revealed about the early Universe.